Blurb: Falling in love is the ultimate magic. For Gwendydd, a young woman in 5th century Wales, it seems an unobtainable fantasy. She dreads the day her chieftain grandfather will marry her off to increase his allies among the warring tribes of Britain. When she meets the mysterious and handsome druid apprentice Myrddin, Gwendydd realizes just how difficult falling in love can be. The ire of her disapproving grandfather is not her only obstacle. Myrddin’s clairvoyant visions of a king who will unify the battling tribes and bring peace to the land become a dangerous obsession that threatens to obliterate their union. 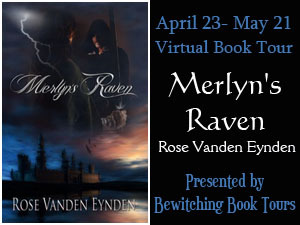 Can Gwendydd support her beloved, the man destined to become the world’s most powerful enchanter, King Arthur’s legendary Merlyn? Or will her devotion destroy her and everything she holds dear? About the Author: Rose Vanden Eynden has always believed in magic, which probably explains how she is able to be a writer as well as a wife, mother, medium, massage therapist, minister, and instructor. She resides in a suburb of Cincinnati, Ohio with her husband, twin teenaged sons, and a dachshund named after Rudyard Kipling. In her spare (!) time, she enjoys performing in live theatre, watching films, reading, and walking in the woods. An avid believer in a balanced life, she meditates and eats chocolate daily. 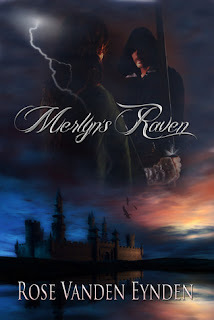 Thank you so much for featuring MERLYN'S RAVEN today! Blessings to all!